It was a benchmark year for the global IPO markets, in more ways than one. In the last quarter of 2010, IPOs broke records in terms of issuance volumes, with $122.2 billion raised worldwide, accounting for more than 45% of the full-year 2010 volume of $269.4 billion, according to Thomson Reuters' 2010 equity capital markets review. Total IPO issuance was more than double the value seen in 2009. 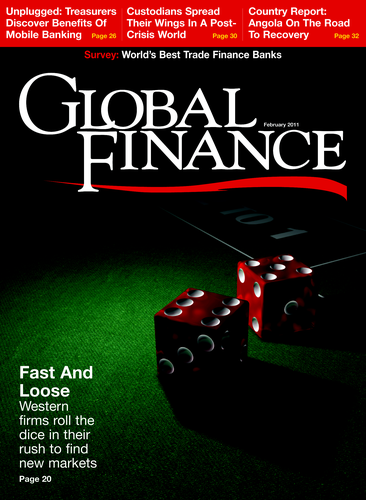 Issuance in the fourth quarter of 2010 alone surpassed 2009's full-year volume of $113.9 billion. In addition, emerging market issuers accounted for 50% of total IPO issuance in 2010—raising $146 billion in new issues. Plus, three of the largest IPOs on record were launched in 2010—all hailing from Asia. Agricultural Bank of China raised $22.12 billion in late July through a dual listing in Shanghai and Hong Kong, while AIG's Asian life insurance subsidiary—AIA Group—brought in $20.5 billion with its listing in October in Hong Kong. Japan's Dai-Ichi Mutual insurance company raised $11.16 billion with its IPO on the Tokyo Stock Exchange in April. In spite of record-breaking IPOs and the massive $23.1 billion equity issuance by General Motors in November, global equity volumes were down for the full year 2010 versus 2009, primarily as a result of a very slow start to the year. 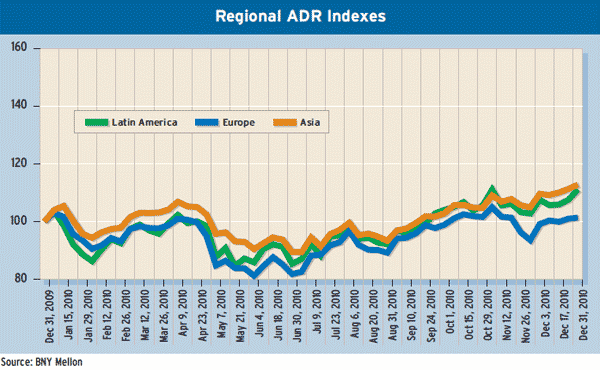 Global equity volumes totaled $854.2 billion for 2010. Global markets were dominated by just four sectors, according to Thomson Reuters. Financial firms accounted for 32% of global issues; energy and power for 16%; industrials for 14% of the market; and materials accounted for 9% of the global equity market. Underwriting fees for equity capital market transactions declined in both the US and Europe but rose dramatically in Asia, according to research from Bloomberg and Thomson Reuters/Freeman Consulting. Globally, equity underwriting fees declined by 13.7% compared with 2009, to $20.3 billion, according to Thomson Reuters/Freeman Consulting. However, this is in stark contrast to Asian markets, where overall investment banking fees rose by 22.2% in 2010 over 2009. Bloomberg reports that US equity transactions brought in $5.7 billion in fees in 2010, marking 10 years of consecutive declines in US equity underwriting fees—aside from a brief bump after the global financial crisis. In 2010 banks charged 3.46% on average for equity underwriting, versus 4.73% in 2000. Despite the steady decline, US equity underwritings cost about 66% more in percentage terms than in Europe, according to Bloomberg data. European equity underwriting fees averaged 1.8% in 2010. Although pension funds and insurance companies have reduced their exposure to European equities over many years now, this trend could change in the coming year, according to Gareth Evans, a strategist at Deutsche Bank. He says: "We believe we could be approaching a turning point in this, given the higher yield of equities and an expected outperformance of equities in 2011." European pension funds' equity holdings as a proportion of total holdings is quite low in comparison with global averages. In 2009, European pension funds held about 35% of assets in equities versus a global average of about 50%. US and emerging market pension funds held around 60% of equity assets. Evans says: "We think that a strong equity market performance in 2011 could alter this view as we progress through the year." He says a total return of around 20% in 2011 on the Stoxx should encourage a reallocation to equities. In the US, equity markets may see greater allocation by investment managers as well. A report by the Investment Company Institute (ICI), found that weekly flows into US equity funds were positive in mid-December, for the first time in eight months. The week ending December 21 saw $335 million in net inflows into US equity funds. However, this is in stark contrast to the $90 billion that ICI reports was pulled out of such funds between May and mid-December.